This is a review of Foot Deodorant Spray which is manufactured by Crystal. Foot Deodorant Spray is a deodorant, not an antiperspirant. It claims to prevent odors caused by athlete’s foot and other fungal infections. Read on to find out if this product is right for you and your symptoms. Natural mineral salts are a popular alternative to traditional deodorants that include aluminium. The odor from perspiration is not caused by the sweat itself but by the bacteria in your underarms or feet. The salts are said to work by killing the bacteria that cause odors. This is also why salt water is used to flush wounds, to kill bacteria to avoid infections. If you try to use this natural deodorant after you have already started to smell, it won’t help you, since it works as a preventative ingredient and it will not cover up existing smells. The instructions for use are to hold the bottle at least 5 inches away from the area you are trying to spray and then pump the bottle 2-3 times or more as necessary. The manufacturer suggests that you use this product daily after you shower. One application is said to prevent odor for 24 hours. The spray is also safe to use all over the body. There are no discernible side effects from using this product. It is unscented and free of the harmful chemicals used in many antiperspirants and deodorants. Crystal claims that this product is safe for use on children. It is also safe to use for women who are pregnant or breastfeeding. Amazon has listed this product listed at $3.99 for a 4 oz bottle of Foot Deodorant Spray. The price for an 8 oz bottle of Foot Deodorant Spray is $7.89. Crystal does not mention a guarantee on its website. The return policy will be adapted to the individual retailer. There are several positive reviews of the product both on the manufacturer’s website and on Amazon. 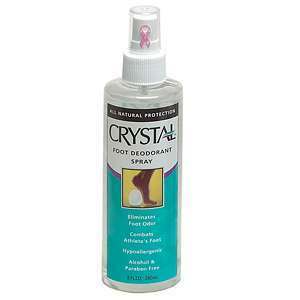 Crystal’s Natural Foot Deodorant Spray claims to help prevent odor coming from your feet by using a solution of natural crystals. There are many reviews on Amazon that support this claim and it is relatively inexpensive. However, there is no guarantee for this product. While it may help alleviate the bad smell caused by athlete’s foot, it does not suggest that it is a cure for athlete’s foot or other fungal diseases. Jimmy Rodriguez	reviewed Crystal Foot Deodorant Spray	on June 11th	 and gave it a rating of 2.5.